The Holiday Inn Express Hotel Indianapolis - Airport is conveniently located off I-70 and S.R. 267 just 8 miles west of the Indianapolis International Airport, and 13 miles west of downtown Indianapolis. Exquisitely renovated. Room renovations completed fall 2007. 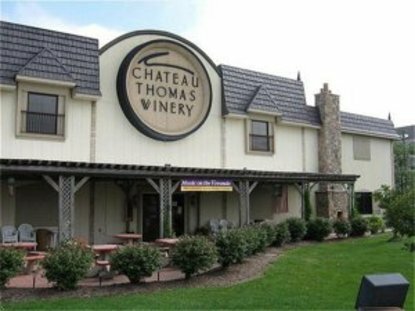 The property is located adjacent to Chateau Thomas Winery and many other restaurants are within walking distance. Holiday Inn Express-Indianapolis-Plainfield is the place to stay for business, leisure or special events. For the corporate traveler, our hotel is conveniently located near Interstate 70 and we are only 8 miles from the Indianapolis International Airport. For our leisure guests we are just a short distance from attractions such as: downtown Indianapolis, Indianapolis Motor Speedway, Indiana Convention Center/RCA Dome, Indianapolis Zoo/White River Gardens, Indianapolis Children's Museum, O'Reily Raceway Park, Conseco Fieldhouse, Victory Field and Circle Center Mall. The hotel features 76 comfortable, attractive guest rooms with many amenities, including free parking, free high-speed Internet access, an outdoor pool, and a guest laundry facility. Each guest room also has coffeemakers, hair dryers, iron/ironing boards, 25 inch TVs with digital satellite and free Fox News and HBO 1 & 2. This hotel is committed to providing accessible facilities under the American Disabilities Act. If your accessibility needs are not met, please contact the Hotel Manager on Duty. Should you require additional information regarding accessible facilities for guests with disabilities, please call 1-800-Holiday (U.S. and Canada) or contact the hotel directly. For the hearing impaired, TDD service is available at 1-800-238-5544 within the U.S. and Canada.